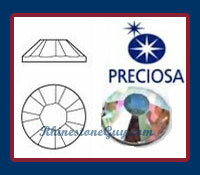 Great prices on Czech Preciosa vintage stock of current rhinestone colors in 8 facets and discontinued stock or colors (8 facets and 12 facet rhinestones) We have both Flat Back rhinestones and Hot Fix Rhinestones. 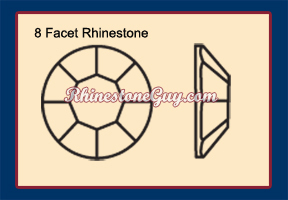 Older, 8 Facet hot fix rhinestones have clear glue. You can still glue them. 8 Facets, best flash... large table top, extra reflection. New! Odds and Ends VIVA 12, Color AB crystals. The listings are updated on a weekly basis so by the end of the week some items may no longer be available, but some NEW items may be added. Please let us know that you want CLEARANCE Stock. Otherwise we assume you are looking for regular VIVA stock. Regular Flat Back stock and Hot Fix stock is available for current colors. - =>means NOT Available in clearance. We have it regular stock, VIVA 12. All colors are AB. Odds and Ends, limited quantities. Need larger quantities? ask for regular stock.